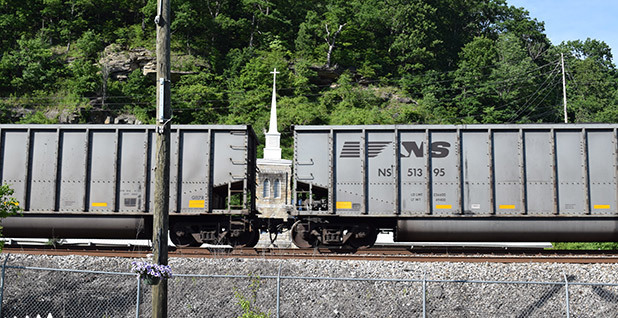 A coal train rumbles past a church and downtown Matewan, a historic West Virginia mining town. Photo by Dylan Brown. 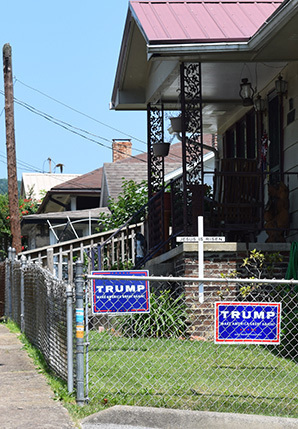 WILLIAMSON, W.Va. -- Churches may be the only thing more common in this Mingo County community than blue signs with red trim reading, "Trump: Make America Great Again." Ever since anyone in southern West Virginia can remember, there have been two constants in these hills of Appalachia: God and coal. Hard times have found the latter. Mining attire -- heavy-duty blue cotton ringed in fluorescent strips -- might still flutter on clotheslines, but Mingo County is down to a few dozen mines run by just a few hundred miners. The coal industry's crash shatters hopes in struggling Appalachian towns. Click here for Part 1. Only one presidential candidate is promising a revival. "We're going to get those miners back to work," Donald Trump said during a rally in the state capital of Charleston last month. There were miners in overalls waving "Trump Digs Coal" signs behind him (ClimateWire, May 10). Republicans and the coal industry are getting behind the presumptive Republican presidential nominee. A West Virginia Coal Association leader put a hard hat on Trump's head, and Murray Energy Corp. CEO Bob Murray, a Republican power broker, called him "all we got" (Greenwire, May 23). Republican Rep. Evan Jenkins, who represents Mingo, called Trump the "clear choice" (Greenwire, May 16). Democrats have long outnumbered registered Republicans in West Virginia, particularly in the southern coal fields. But the New York City billionaire has found his base in Appalachia's fed-up, increasingly unemployed working class. Trump's favorability numbers are abysmal nationally, but positive in West Virginia, according to a Public Policy Polling survey, which put him 27 points ahead of presumptive Democratic nominee Hillary Clinton there. Endorsements of presumptive Republican presidential nominee Donald Trump dot Delbarton, W.Va. Photo by Dylan Brown. The rest of the country might be climbing, albeit slowly, out of the Great Recession, but things are only getting worse in many coal communities, particularly Mingo. Residents are demanding "Jobs. Jobs. Jobs." as it says on campaign signs for Jim Justice, the Democratic billionaire coal mine owner running for West Virginia governor. Unemployment is in double digits, and the area is ground zero for the nation's opioid epidemic. Coal still has a stranglehold on the local economy, but the industry is fading. Natural gas will surpass coal as the dominant generator of U.S. electricity this year, said the U.S. Energy Information Administration. The Obama administration and many Appalachian lawmakers, even some Republicans, have their sights set on economic diversification. "To what?" Mingo County Commissioner Diann Hannah said. "We have no infrastructure here." After years on the slide, Mingo is fiercely proud, but realistic, Tug Valley Chamber of Commerce President Leigh Ann Ray said. A full-fledged coal revival is unlikely, and God, not Trump, has their faith. "We're a very faithful people," she said. "And we just don't give up." Coal kept the lights on in America for decades, but many residents feel Mingo never truly reaped the rewards of its coal riches. Politicians have left voters here feeling abandoned, forsaken and forgotten. Federal regulations -- just about everything coming out of U.S. EPA -- have only exacerbated feelings of isolation and detachment. Trump summed up that disillusionment in his usual style at an early GOP Republican debate: "Our politicians are stupid." Hannah said, "I've never lived in a foreign country, but man, I'm telling you what, we've got some educated idiots running this place." Top of the list, thanks to what Mingo residents call his "war on coal," is President Obama. "The Obama administration has destroyed us," Sheriff James Smith said. "Obamanomics: trickle up poverty," says one truck's bumper sticker. More common is "Friends of Coal" paraphernalia -- stickers, license plates and billboards. The industry advocacy group has its name everywhere, including the office door of the Mingo County assessor's office. Even if West Virginia wins its fight against the Obama administration and EPA regulations, analysts have said coal will never really be back, at least not the way it used to be. "I hope we get a president in there that's really for coal and we get our coal business back, because without it, Mingo County and West Virginia ain't got a future," Smith said. Coal will remain a sizable part of the world's energy mix for years to come, something the Obama administration has acknowledged and a fact the nation might need to come to terms with, said Hannah. "Shut the power grid down that coal powers up right now," she said. "See how many people are happy with this government." Mingo also throws shade at the media for painting West Virginians as backwater simpletons. Residents say they are well aware of the complex array of forces hamstringing coal. "There's more levels and layers to the whole thing than just Obama screwed us," said Hannah, adding that "He didn't help in any way, shape or form." Obama lost West Virginia in both of his presidential elections, faring worse on the second try. In 2008, he lost to Sen. John McCain (R-Ariz.) by roughly the same 12-point margin in both Mingo County and West Virginia. In 2012, Obama pulled in just 36 percent of the vote in the state and just 28 percent in Mingo. In the 2012 Democratic primary, Obama was the incumbent, unchallenged by a mainstream Democrat, but he managed to lose in Mingo by 20 points to Keith Judd -- a federal inmate serving a 17-year sentence for extortion in a Texas prison. Although the president carried West Virginia as a whole in that primary, Judd raked in 41 percent of the vote. Ray said southern West Virginia is cautiously optimistic about a Republican administration led by Trump. "They know better than to think that a snap of a finger and an oath of office for somebody other than Hillary Clinton or Barack Obama is going to save the world immediately. They know better," she said. Murray has told Trump to refrain from making grand promises about reopening the mines, according to SNL Financial LC. It doesn't seem like the mogul is ready to take the advice. Ray said people "can only hope a new administration that is a little more objective when it comes to regulation." West Virginia used to be a blue bastion on the electoral map. And Ray, who is county grant writer and owner of the Tug Valley Inn in Williamson, Mingo's county seat, used to support Hillary Clinton. Bill Clinton got her vote twice, and Al Gore did, too, despite some trepidation about his environmental policies. 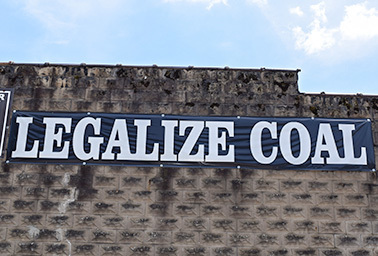 Grievances about coal regulations are aired on the side of a building in downtown Williamson, W.Va. Photo by Dylan Brown. "In 2008, I was one of Hillary's biggest supporters," she said. "I donated to her campaign; I had a Hillary bumper sticker; I had a Hillary T-shirt." When Clinton trounced President Obama 67 percent to 26 percent in the 2012 West Virginia primary -- 88 percent to 8 percent in Mingo -- she and friends drove up to Charleston to party with Hillary. "She shook my hand; I thought it could have been Rod Stewart or somebody," she said. Eight years later, Clinton is ready to party at the Democratic convention in Philadelphia. "Now? Can't do it," Ray said. Now she's voting for Trump. "Do I really think that he's the best candidate? No," she said. "But I'd rather have an outsider go in and try to shake things up than just continue the protocol." Coal woes in Mingo date back to the 1970s. West Virginia still ranks as the nation's second-largest coal producer, but the high-water mark for production was in 1947. The villain is government, many residents say, a catchall for Mingo's disdain for edicts from Washington, D.C., that can change people's lives. "The government, ever since I was in junior high school, they've been trying to kill coal here," Hannah said. The Obama administration is the modern face. "These people have done absolutely nothing for us. Nothing. And I'm a Democrat," Hannah said. Of course, Appalachia Democrats are a different breed -- religous and socially conservative. West Virginia hasn't voted for a Democratic president since Bill Clinton, and it's down to one Democrat in Congress, Sen. Joe Manchin, who hasn't been spared the voters' rod for endorsing Clinton. "I understand he's just a little squeaky voice in a big wheel, OK?" Hannah said. "He went to Washington with fire and vinegar in him, and I don't know what happened." Instead of protecting the working poor, Hannah said, national Democrats have lost their moral compass, citing the debate over transgender people and bathrooms. "I'm not leaving my party; my party's leaving me, OK?" she said. "They're gone." With some of the newest bricks in Williamson -- circa 2004 -- belonging to the U.S. Social Security Administration, Hannah worries about a citizenry dependent on government. "They brought welfare in here, which was a pretty good program when it was needed, but now it's become a way of life," she said. Living on a fixed income because of frequent doctor visits, resident Becky Jackson said there is simply "nothing else to turn to here." The 44-year-old said she would work if she could, but her lungs keep her from making it all the way down the street. Trump's plans to slash entitlement programs -- the only thing sustaining so many Mingo residents -- would be a disaster, she says. "If they vote for Trump, we're all history, because he's wanting to wipe out Social Security and everything, from what I hear," she said, sitting outside her apartment, adjacent to the United Mine Workers of America union hall in Matewan. "The grown-ups can pretty much try to scrounge, but these little kids that's out here won't get their food stamps and eat. That's not right," said Jackson, whose life revolves around her six grandchildren. "It's not their fault. It's not the little kids' fault. [Trump]'s already made his trillions." Hatred of Clinton, she said, is state pride talking. Obama didn't help, but she's leaning toward Clinton because she believes in her husband's legacy. "We're history, either way you go," she said. Even though many unemployed miners are leaving the country and state, Jackson sees only one option -- stay in Mingo. "Where am I going?" she said. "My family's here, so what little bit I got is here." Ahead of last month's primary, Trump enjoyed his rapturous 10,000-person rally in Charleston, W.Va. Clinton went on a road trip through Appalachia, only to get a tongue-lashing in Williamson (Greenwire, May 5). Comments she had made two months earlier dogged her. She had said during a televised town hall meeting, "We're going to put a lot of coal miners and coal companies out of business." Clinton apologized and argued that critics were ignoring her next sentence, touting a $30 billion plan for job training and health care in Appalachia, but the damage was done. "How could you say you are going to put a lot of coal miners out of jobs and then come in here and tell us how you're going to be our friend?" unemployed local coal miner Bo Copley asked Clinton, tears in his eyes. Clinton also got into a war of words with disgraced former Massey Energy Co. CEO Don Blankenship, a Mingo County resident who was spotted hanging out on the fringe of the anti-Clinton protest outside the Williamson Health and Wellness Center. "Don's more popular around here then you are, girlfriend," Ray said. Clinton lost to rival Vermont Sen. Bernie Sanders statewide in May's primary. In Mingo, she lost not only to Sanders, but also to local lawyer Paul Farrell Jr.
Ray said coal is central but views Clinton as anti-military, and is frustrated that she gave up on government-run universal health care. The best health care Ray said she ever had was thanks to Blankenship's Massey Energy. Hannah, who goes to church with Copley -- "the most humble guy you'll ever meet" -- said maybe it wasn't reported in full context, but Clinton's message was plain. "She said that coal mining was over, but they were going to take care of the miners," she said. "Well, how are you going to do that?" Clinton's $30 billion plan, she said, is only "a drop in the bucket" with the huge task facing Mingo. Agencies are already spending millions of dollars bringing fiber-optic cable and reliable mobile phone service, but the mountain isolation makes it expensive and difficult work. Hannah said Mingo is still working on its sewers and potable water in many places -- work that should have been completed 20 years ago. "It will cost a small fortune to get us up to par to even offer anybody what you can do in Columbus, Ohio," she said. One hope is building on former mountaintop-removal mines. Last month, a Texas ammunition company proposed building a manufacturing facility on 1,000 acres of reclaimed land in nearby Kanawha County. About 400 workers would make specialty rifle ammunition to be used by Olympic marksmen and expert hunters and in specialized U.S. military applications. In a region where flat land is at a premium, reclaimed mine sites offer usable community property out of the floodplain. "It's better than it was before they even started taking the coal out," Hannah said. Environmentalists have long made mountaintop-removal mining one of their top targets. They say the practice pollutes land and water, and companies are never able to put it back the way it was. Ray said "Hollywood types" see only the devastation of active mine sites when they fly over Appalachia, leading to "insane" misperceptions of coal. 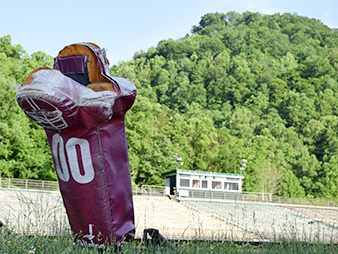 A football tackling dummy stoops in uncut grass at the former Magnolia Matewan High School. Declining enrollment shuttered the school in 2011. Students now attend Mingo Central High School. Photo by Dylan Brown. "When they're in Washington, they're looking at paper ... they're not coming down here every day and watching people pack up and leave," she said. But reclaimed land is often isolated. Mingo Central High School is built on reclaimed land, but is at least 15 minutes from all its students, said Hannah, who does excavation and reclamation work through her company, S&E Clearing and Hydroseeding LLC. With coal still left in the ground -- much of it uneconomical to recover at current prices -- the industry of the present still seems like the best option. "What's the alternatives?" Hannah said. "They're going to put us up some windmills, and they're going to kill all them bats that they shut down these mines over killing." Congress is considering multiple proposals to accelerate reclamation funding to spur economic growth (E&ENews PM, March 23). Lawmakers have also funneled grants and other aid. "Economic growth into what?" Hannah said. "What are you going to have your people working doing?" Elsewhere, the Hatfield-McCoy Trails, a network of off-highway vehicle trails, bring in dollars, giving some hope for tourism in mountains, but West Virginia still faces the uphill battle of attracting businesses. "You've got to have a lot of help from your state," she said. "You've got to have leadership that will give tax incentives and tax breaks and different things to bring companies here and be able to compete with other states." Not only is an older workforce unemployed with a certain skill set, but it's unlikely that wages will ever approach the upward-of-$50,000 salaries at coal jobs. Yet, there is still miner pride -- desire for a hand up, not a handout -- Hannah said. "We're going to see a turnaround, but it's not going to be a man who turns this around; there's not going to be an individual that turns this around." She said: "I think God has got a really big plan for us."